Tsunamis are caused by sudden displacement of large volumes of water such as earthquakes on the ocean bed, landslides, volcanic eruptions or meteorite impact. Tsunami is a Japanese word that means ‘harbor wave’, which is a very misleading name for this phenomenon as it is anything but a simple wave. Tsunamis are different from the normal waves that are usually generated by winds. 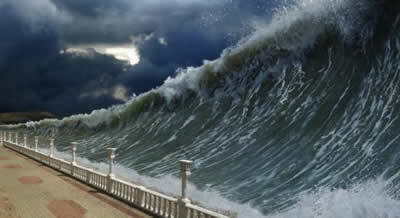 Tsunamis are very large wavelengths that measure 10 and 500 km and can travel more than 700 km/h. It may appear like one huge wave, but it is actually multiple waves that travel only a few minutes apart. Tsunamis can have devastating effects on the neighboring areas because of their force at which it can hit land. Unlike normal waves that are just movement on the surface, tsunamis move entire water column all the way to the floor bed. While, they are hard to catch by the naked eye, there are instruments that can measure water movement and the floor displacement in order to estimate tsunamis. The first sign of a tsunami is usually fall of sea levels and emptying of bays. As the wave approaches the shore, the shallow water at the shore slows down the water. This results in the water at the back to bunch up and the rear sections to catch up with the slower front sections, which results in the towering heights of the wave. So, how do the tsunamis actually form? Well, the major causes of land displacement on the sea floor includes earthquakes on the sea floor, landslide, volcanic eruption, impact by a meteorite. Earthquakes on the floor bed are caused by the shift of tectonic plates on the sea floor, which results in the displacement of water. Landslides that happen underwater or coastal landslides that fall into the ocean can also cause enough displacement for tsunamis to happen. Volcanic eruptions or explosions can also cause movement on sea floor and with enough force it can cause tsunamis to form. Meteorites that fall in the ocean or sea can cause water displacement because of the force of which it falls, resulting in forming of tsunamis.